That Atlantic 10 released this year’s preseason poll and it’s Archie Millers Dayton squad taking the top spot. The Flyers secured 16 of the 28 first place votes, just ahead of Rhode Island who rose to second a season after finishing seventh thanks to an injury-filled disappointing year. 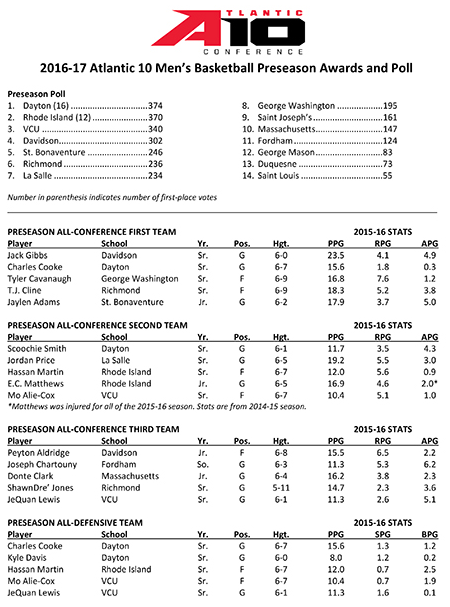 The URI Rams grabbed the other 12 first place votes, vaulting them ahead of last year’s first place Rams, VCU, who finished third in this year’s preseason voting. Davidson checks in at fourth thanks to First Team selection Jack Gibbs who’s joined by Third Team pick Peyton Aldridge as the Cats’ two all-conference selections. Bob McKillop’s group was one of three teams to land two players on the First, Second or Third teams, joining VCU and Rhode Island. Dayton had just one player crack those teams but did land two on the All-Defensive unit with Charles Cooke and Kyle Davis, joining VCU with two of their own in Mo Alie-Cox and JeQuan Lewis. Rhode Island’s shot-blocking big Hassahn Martin rounds out that group. La Salle is expected to be one of the most improved teams this season, finishing seventh in the voting after checking in at 14th in last season’s final standings with a 4-14 A-10 record. 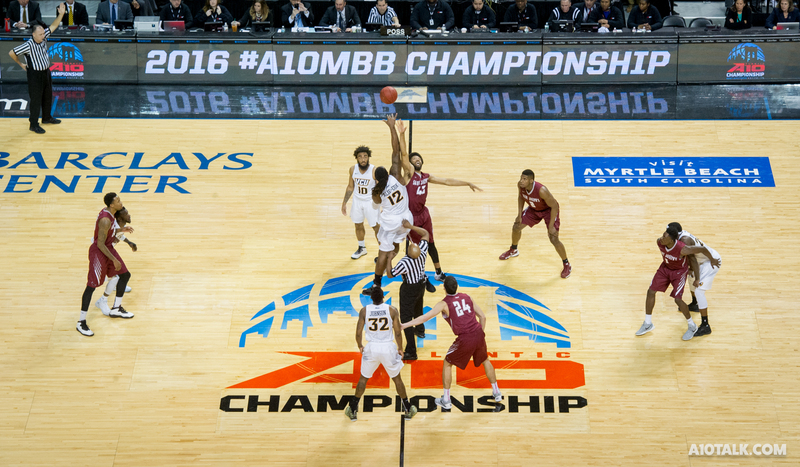 Saint Joseph’s on the other end was picked to finish in the bottom half of the conference after winning last season’s tournament title an an NCAA tournament game over Cincinnati. The Hawks lost three key players in all-conference selections DeAndre Bembry (2016 A-10 Player of the Year) and Isaiah Miles, as well as talented senior Aaron Brown.